NOW LEASING – NEW SPACES WITH GREAT PRICES! People and businesses continue to relocate to Katy, TX for the excellent schools, thriving economy, great shopping, access to downtown Houston, wonderful lifestyle and neighborhoods. We are proud to be part of this vibrant community and look forward to being your personal storage or business storage solution. Come see why people rave about using our storage units. When you enter 1st American Stor-It you will feel as safe as you do in your home. Our facility prides itself on providing a safe experience for you and your belongings. Well-lit buildings and aisles and a manager living on site is our first line of security. 24 hour recorded video surveillance in our state-of-the-art self storage location is the second line to ensure your safety at all times. Whether storing personal valuables or important company inventory, we have the security measures in place for the safety & security of your belongings. We make sure your personal storage unit is in good hands. Visit our unit sizes and prices page to what we have available. 1st American Stor-It offers one of the most convenient locations in Katy. Just minutes from highways and other major streets, we make it easy to stop in on your way to work or after dropping the kids off at school. We want you to always feel at home when you enter our facility. Our friendly Customer Success Manager is happy to show you around our clean mini storage units while sharing a hot cup of coffee or cold bottled water. Stop by during regular business hours to discuss your self storage needs. Our office is open 7 days a week! Choosing a storage location with a variety of storage spaces as well as indoor and outdoor drive-up options are important. 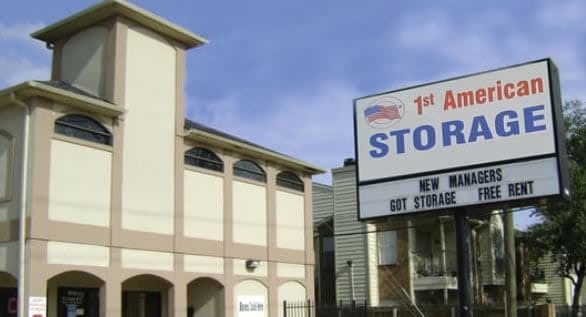 1st American Stor-It has a variety of standard, climate controlled storage, and drive-up spaces for your storage needs. Climate controlled storage is an excellent option for your storing items that need regulated temperature and humidity. We realize that storing your things often causes financial stress, so we offer flexible mini storage payment options including online bill pay, auto-pay, and month to month rentals and leases on a variety of personal storage units. 1st American Stor-It sells a range of professional supplies to help you keep your things in the best possible condition. Our customer success manager can advise you on the best options on anything storage.